NLZIET is the online service of Dutch broadcasters that provides non-stop TV - commercial free. The online service is offered by NLZIET Coöperatief U.A., founded in Hilversum. NLZIET is a unique partnership between NPO, SBS en RTL that brings you the most current Dutch television online. The streaming service brings the best of all channels straight to your device and lets you see your favorite content in high quality; anytime, anywhere! NLZIET gives access to more than 2800 programs on iOS, Android, web, Apple TV and PlayStation. The app gives you easy access to the content of NPO, RTL XL & KIJK and unites these platforms within one app. 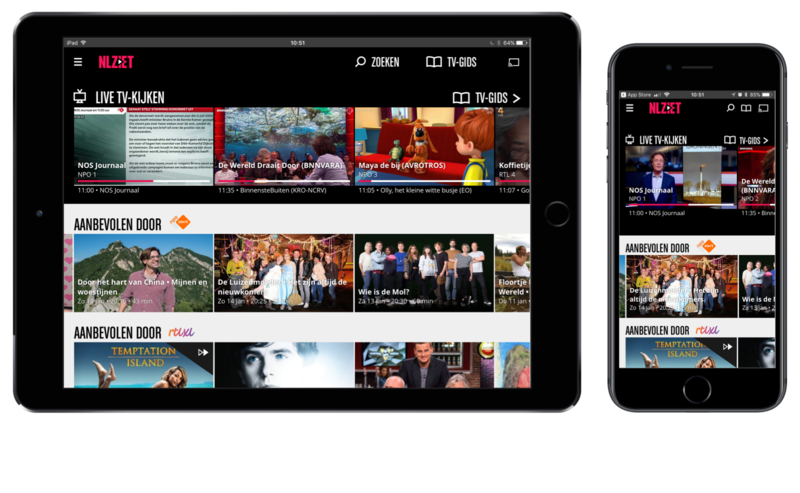 The subscription-based service of NLZIET enables you to watch the most complete and current Dutch TV offering online. Both on-demand and live! Sometimes episodes are available even ahead of the linear broadcast. All content is, of course, protected by DRM. The app introduces a modern and user-friendly look-and-feel that brings you the ease of watching your favorite videos whenever and wherever you want. Search by most viewed, highlighted or in the smart search bar for content you like. The ‘favorite’ option lets you keep your favorites in your private collection so you are notified as new episodes are available.